What does it mean to be a ‘sustainable city’, and which cities around the world are best at it? A new index sets out to find the most successful from a list of 100 cities. The ranking from Arcadis, a design and consultancy firm, and the Centre for Economic and Business Research, assesses the sustainability of cities based on three dimensions. The ranking also highlights the pressure cities are under – from population growth to natural disasters. The index uses ‘three pillars of sustainability’ to rank 100 global cities. You can see the full ranking here. People (social): The people pillar looks at quality of life, assessing areas such as health, education and work-life balance. Planet (environmental): This pillar examines areas including energy consumption, renewable energy share, and green spaces. Profit (economic): The economic pillar looks at environment and economic health of the city. Sub-pillars include ease of doing business, GDP per capita and connectivity. 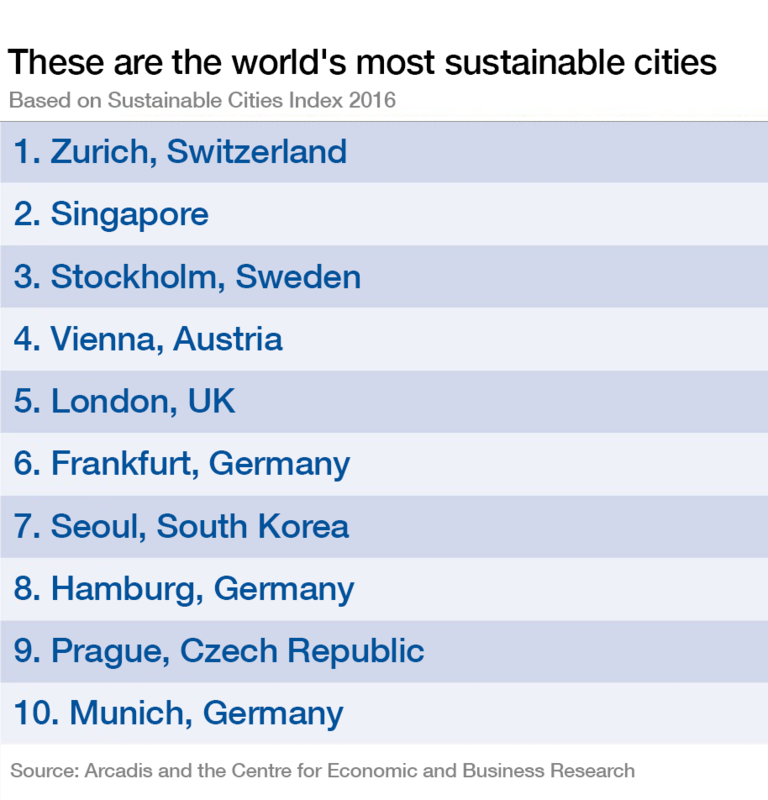 The Swiss city of Zurich tops the ranking. It tops the environmental dimension, and is 5th in the economic pillar, but scores less well in the social dimension. The report highlights affordability and work-life balance as the main reasons for this. Singapore, the city-state, takes second place, while Stockholm, Sweden’s capital, completes the top three. The top 10 is dominated by European nations, with Singapore and Seoul the only cities to break the monopoly. German cities feature highly, with Frankfurt, Hamburg and Munich all making the top 10. The report highlights this geographical bias and the authors suggest that “comparing cities with their geographical peers or with similar sustainability challenges” offers a better comparison. However, the ranking offers cities the opportunity to learn from those higher up. The report emphasises that no city effectively balances all three pillars. Meanwhile, the World Economic Forum’s ‘Inspiring Future Cities & Urban Services’ report highlights the challenge posed by urbanization around the world. The report suggests that current patterns are currently unsustainable. However, the report offers solutions, arguing that urbanization, when properly managed, can be a powerful transformative process. With the UN’s Sustainable Development Goal 11 also focusing on sustainable cities and communities, sustainability is a hot topic for cities across the globe. This entry was posted in Uncategorized and tagged Development Goals, Environmental, MinBuza, MKB, sustainable cities, Wereldbank Groep by NL4WorldBank. Bookmark the permalink.